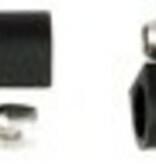 Injection molded PVC two-prong plug and socket connector set is polarized to assure the proper mating of circuits reducing the chance of accidental reverse polarity. Color-coded 16-gauge 12” lead wire with bullet-type contact pins. Weatherproof connectors are vibration and strain resistant. Use of dielectric grease recommended to further protect circuit from salt spray, debris and corrosion. Rated at 20 amps. 12-24VDC.